Ok sort of day today. Just going through the motions. Crossed the Whanakai bridge early this morning, the longest foot bridge in the southern hemisphere, and was meant to start walking around the estuary but the tide was high and it called for a 1km road walk diversion. 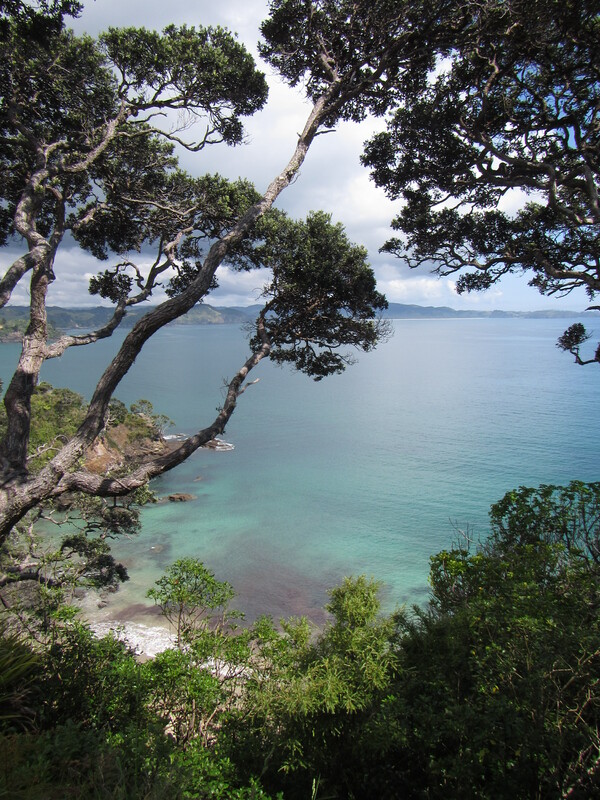 Soon enough it was onto the Whanaki Coastal Walk through a mixture of private beach fronted properties and pine forest. The track was really well maintained and resembled a golf course fairway, well mown, well bench out and clearly marked. Specatular views were had over the eastern coastline with calm emerald waters brushing the steep rock ledges. After a couple of hours it was time for a break and I found the perfect spot. 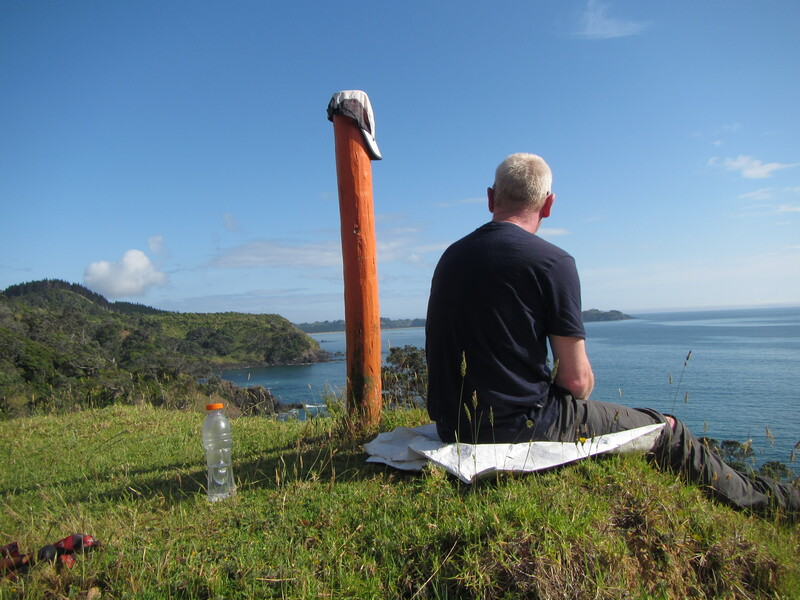 Perched high above the cliff line over looking Sheltered Bay, the vantaged point showed the distance that had to be covered to Matopouri. Then it was onto the road walking. Oh the road walking. An unfortuante necessity to link sections of trail but I am sick of it. Most of the road walking is on the Northern Island. It is hard. Hard under feet. Hard with the traffic. Constantly criss crossing the road to make sure you don’t walk around blind corners. Some nice coastal views along the way. Into Matatpouri I headed straight for the shop for some icecream. Trail magic number 1 for the day. I bought a Gatorade and asking for a single serve of chocolate, the shop attendant prompted added 3 scoops “Ice-cream’s on the house. We need to look after you guys.” Nice. A short road walk and then back into the forest. A few ups and downs. I came across a really nice benched section of track that had switchbacks and steps cut instead of the old straight up and down. 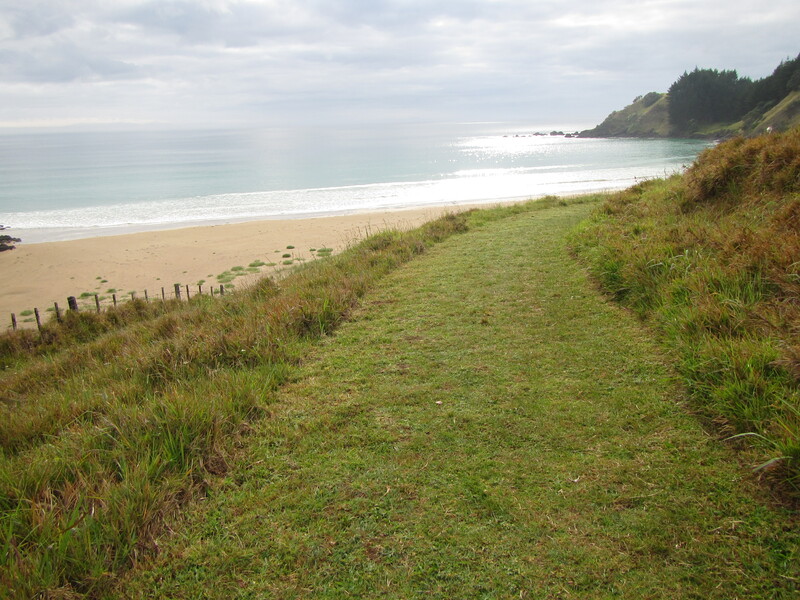 I was beginning to think New Zealanders were trying to take the piss out of foreign walkers with these straight up and downs, until coming across this nice track. Then I came on a sign stating you are walking on private land. The landholders have obviously done this great work off their own accord. 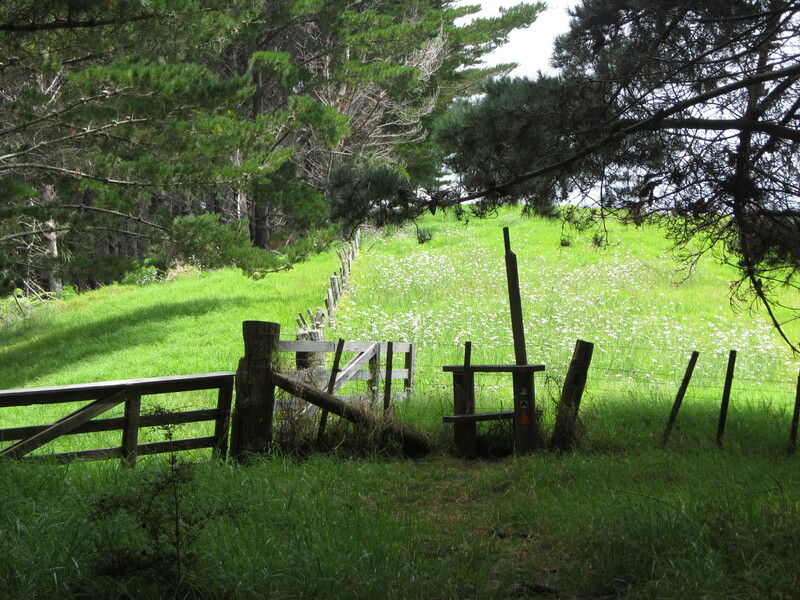 Climbing over the next stile back into DOC land the track promptly returned to the what I had become accustomed to. Along the way the track passed by a kauri tree so large they had to name and protect it – Tena Moana ‘the big one’. Coming out of the forest towards Ngunguru it was back to road walking. Along the way I saw a trail marker on the side of a power pole, pointing the way to towards ‘trail magic’. 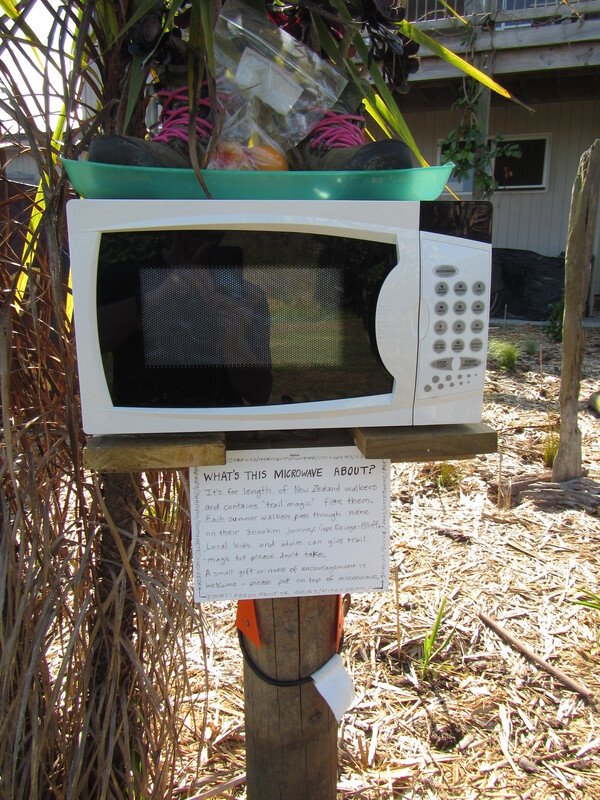 The trail led to a microwave oven at the back of a property offering gifts to TAers. I took an apple, sat down and just about inhailed it. Fresh fruit – yum. Juicy apple – incredible. From there it was the last 2km road bash to the Riverbank Homestay B&B where trail angels Melva & Hilton host trampers, allowing them to camp in the veggie patch. I was greeted warming by Melva who showed me around – drinking water, out door hose shower, toilet and veggie patch. The perfect veggie patch that is a rambling mess with food and flowers everywhere. Melva even brought down a bottle of home brewed ginger beer and later preserved fruit and oat slice fir desert. Initially I had the run of the place myself and relaxed under the shade of a feijoa tree. As I was enjoying desert and conversation with Melva a car pulled up and out jumped the US girls, Michala and Shana, stuffed from a big day but happy as ever after celebrating Thanksgiving today. Their travelling companions from the start Zeeda and Petra finished with the trail this morning and went onto explore other things New Zealand has to offer. Love your words – keep the excellent visual descriptions. I’ve just been told that the ice cream in NZ is real ice cream nothing like here in Aussie. Can hardly wait for our trip coming up in April 2016. Might just miss you mate.